Tamara Álvarez alvat032@newschool.edu PhD Air, Sky & Outer Space; Subterranean Geographies; Human-Technology-Environment Relations; Space Exploration; Cosmologies; Atlantic Settler-Colonial Histories; Europe; the Moon. 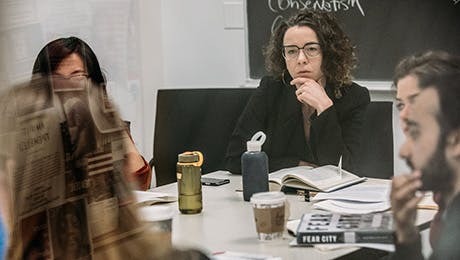 Brie Gettleson gettb757@newschool.edu PhD Femicide, post-conflict violence, Guatemala/ Central America, democracy, human rights, and new forms of militarism and state-security. Charles McDonald mcdoc390@newschool.edu PhD Race and religion; historical ethnography; conversion; inheritance; liberalism and multiculturalism; citizenship; experimental writing; Spain; Europe; U.S.
Ana Maria Ulloa Garzon ulloa947@newschool.edu PhD Food and the senses; flavor research; relations between science, food industry, and gastronomy; United States/Spain.